Tricia was born in Montreal to a Canadian mother and Bermudian father. Raised in her family home on the water in Bermuda, she had a magical childhood swimming, boating, scuba-diving, sailing and enjoying the beauty of her island home. She went to an all-girls boarding school in Toronto at the age of 12, and it was there that she fell in love with skincare products. Forever reading glossy magazines and browsing through department stores for new skincare finds to sample with her friends, she even wrote copy on beauty and luxury items for publications in her early, post-university days. Today, Tricia still finds herself scouring the web and boutiques for new, healthy and fun body products. 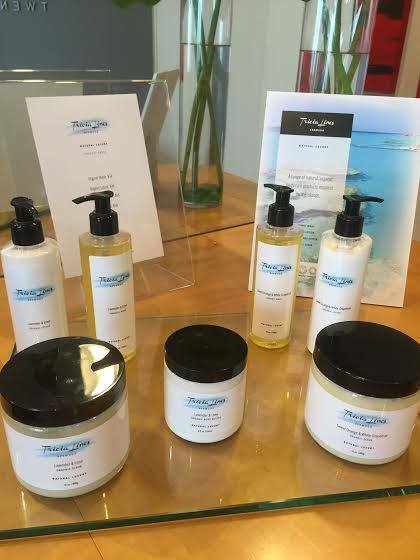 A self-described beauty-product junkie, Tricia decided to launch her own line of natural, organic body care. While there are many luxury lines out there, she found that few were available using natural and organic ingredients. She wanted her line of washes, scrubs and lotions to be as luxurious as they are healthy for the body, and the planet. Tricia Lines – Natural Luxury – was born. Her products are formulated with the best natural, organic ingredients and layered with notes of fresh-smelling scents inspired by life in Bermuda.